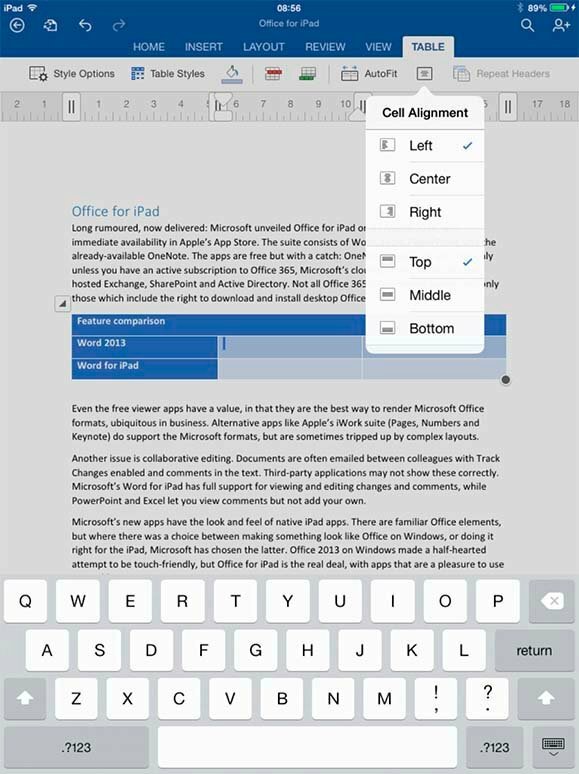 Word for iPad: Working with a table in Word for iPad - Test drive: Is Microsoft Office for iPad a strong start for mobile Office? Microsoft’s new apps have the look and feel of native iPad apps. There are familiar Office elements, but where there was a choice between making something look like Office on Windows, or doing it right for the iPad, Microsoft has chosen the latter. Office 2013 on Windows made a half-hearted attempt to be touch-friendly, but Office for iPad is the real deal, with apps that are a pleasure to use on a tablet. The interface design is clean and understated, with a simplified tabbed ribbon control along the top of each app. Unlike the desktop apps, this never offers more than one line of icons, so does not occupy too much screen space. Tapping the save icon brings up a menu including searchable Help and Support. Word for iPad is perhaps the best of the apps. The clean user interface disguises the depth of available features. Select a word, for example, and you can tap Define and see a dictionary definition. Editing options include multiple columns, headers and footers, paragraph styles (though with some limitations), multiple columns, page numbers, tables with a range of styles, images that you can resize, rotate, display in different styles, and with various choices for text wrap, and a wide selection of shapes that can have text within them. Insert a tab, and double-tap to choose between left, right, center, decimal and bar. This is a capable word processor. There are of course plenty of missing features, compared to desktop Office. In Word’s case, absent features include macro capability, paragraph style editing, thesaurus, grammar checking, equation editor, editing table of contents and indexes, and custom templates, though a range of built-in templates are supplied. None of the Office apps support printing. Another issue is that whereas the full Microsoft Office supports a range of file formats including Open Document, an ISO standard preferred by some organisations and public bodies, the iPad apps require use of Microsoft’s Open Office XML (.docx, .xlsx and .pptx) for editing. In a brief test, Word for iPad was not even able to open an Open Document word processor file. Office binary formats such as .doc and .xls are supported for viewing but not for editing. If you try to edit, a message appears offering to convert the document to the newer format.